Chappie (2015), Short Circuit meets RoboCop in this visually striking and emotionally captivating take on artificial intelligence, humanity, and a robot that will touch your heart. MY CALL: Short Circuit (1986) meets RoboCop (1987, 2014) in this visually striking and emotionally captivating take on artificial intelligence, humanity and a likeable robot. 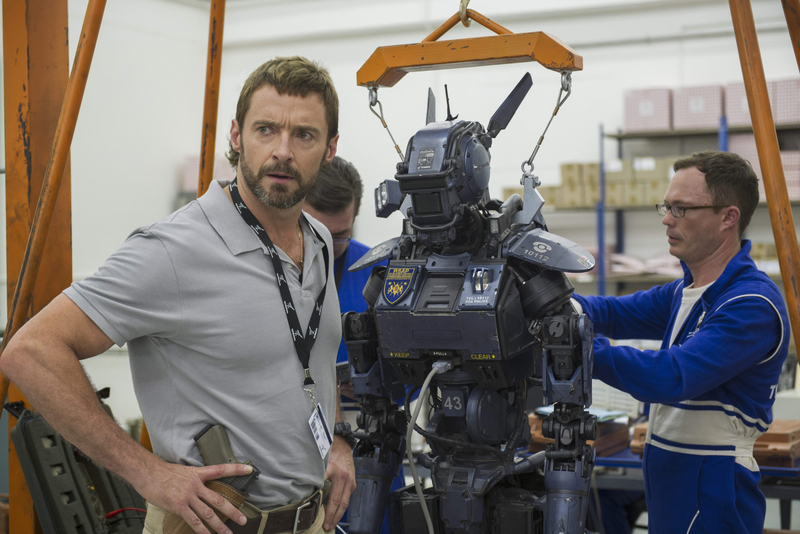 Chappie is vibrant, emotionally fragile and soulful; expect him to touch your heart. MORE MOVIES LIKE Chappie: RoboCop (1987, 2014), Short Circuit (1986, 1988), The Machine (2013), I, Robot (2004) all include critical elements we see echoed in Chappie. 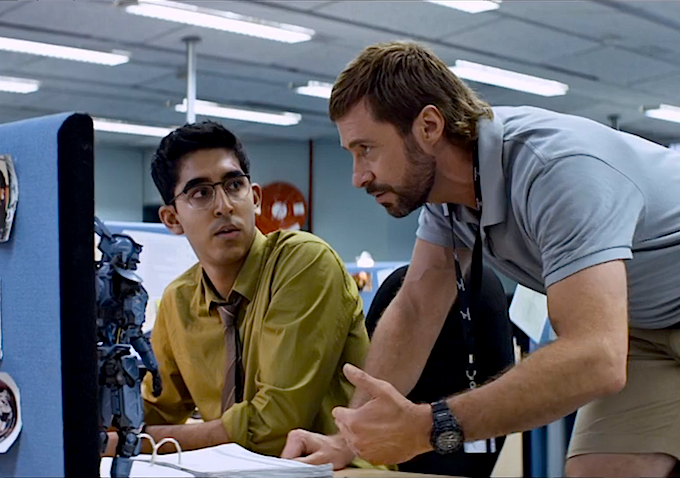 Set in the near future, Chappie begins when artificial intelligence engineer Deon (Dev Patel; The Newsroom, Slumdog Millionaire, The Best Exotic Marigold Hotel) creates an AI program that is self-aware and conscious. Working for a weapons company, Deon previously pioneered the technology enabling a completely robotic and ever-growing police force in South Africa and he uploads his program into a damaged robotic unit scheduled for destruction. One problem we encounter (and many reviewers are slamming hard) with the story is that it encapsulates too many sub-stories with too many antagonists (or, more like characters with conflicting motives). 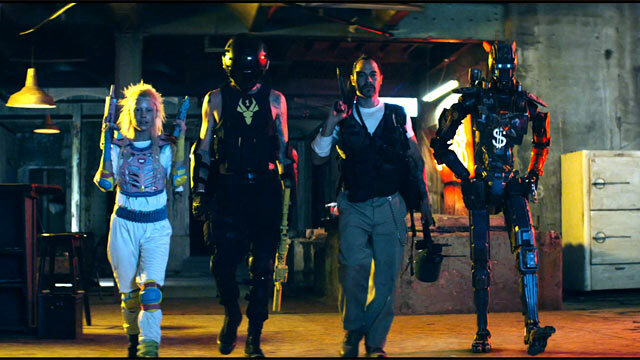 Chappie (Sharlto Copley; District 9, Oldboy, Europa Report) and Deon are clearly our “main” protagonists. The weapons company CEO (Sigourney Weaver; Alien, The Cabin in the Woods) and an ex-soldier-turned weapons engineer with a ridiculous mini-mullet (Hugh Jackman; The Prestige, Real Steel, Prisoners) are introduced to us as being of questionable roles (neutral vs antagonists). There is a sort of Mad Max: Road Warrior gangster lord who is pure evil and has no business being in the story. 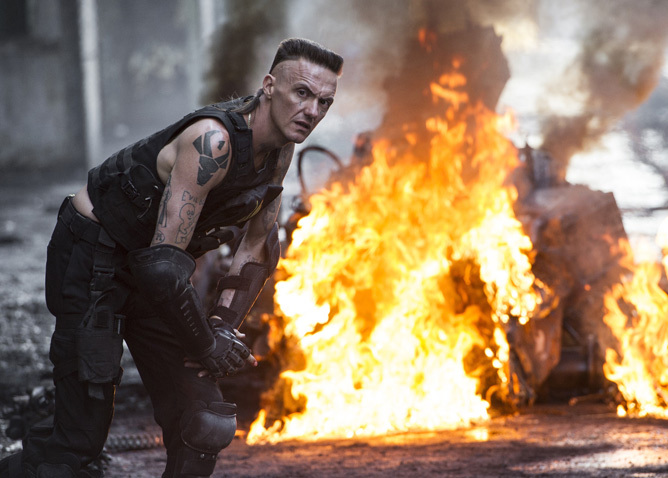 And some semi-likable criminals (Ninja and Yo-landi VI$$ER of South African hip-hop/alt band Die Antwoord, and Jose Pablo Cantillo of The Walking Dead and Sons of Anarchy) are introduced who usher Chappie through his development, but on questionable terms. Another thing that many (generally negative) reviewers have honed in on is that much in this story will feel familiar. Scenes echo Johnny Five (Short Circuit) discovering new things, being excited about the world, learning new words and how to express himself and even being misled by gang members (Los Locos, from Short Circuit 2). The setting and mechanized law enforcement, the position of the weapons industry, and the ethical tug-of-war encapsulating it, smacks hard of RoboCop…and you’ll even see a larger, human-operated robot that will look like a newer version of RoboCop’s big bad ED-209. And the self-realization and emotional conflicts often mirror both I, Robot and Short Circuit. 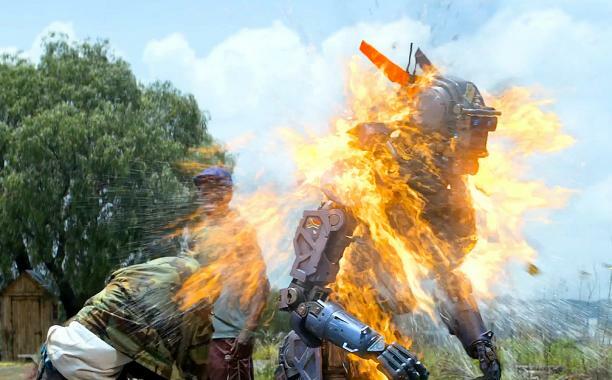 But while pieces of Chappie are “like” pieces of other movies, the final product creates a very new, intense and emotionally kinetic experience. Chappie learns about thug life. 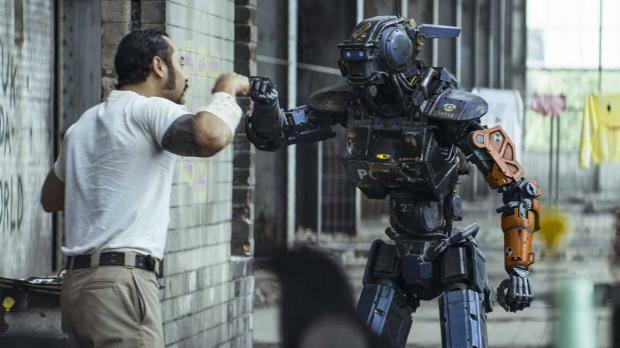 Thugs teach Chappie to fist bump and look cool. Despite some familiar components and the “problem” of too many antagonists (both of which I find forgivable given this film’s other powerful merits), the film remains exceptional and the story boils down to this… Chappie is created and falls into the wrong hands. His exploiters form strong relationships with him (some sincere, some not) and lead him down a manipulative path of crime. 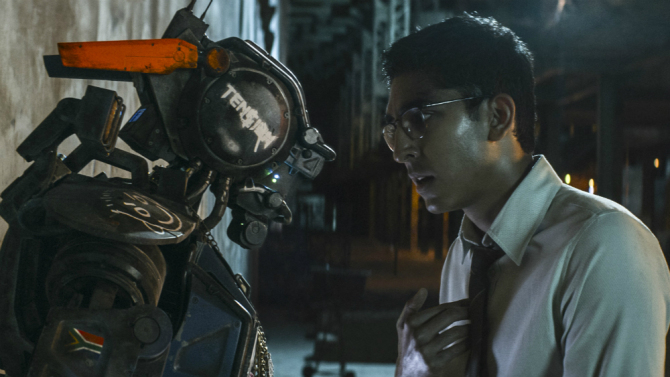 Like an adolescent, Chappie makes strong emotional connections and, like a rebellious teen having lost his child-like innocence, he scornfully pulls away from his loved ones when he discovers (or wrongly perceives) lies or mal-intent. 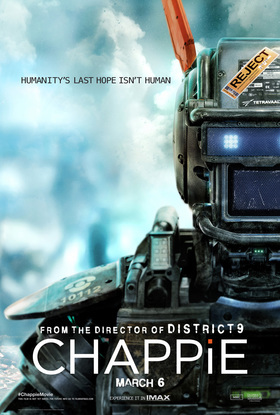 We watch and hope as Chappie discerns right from wrong…and the true intentions of those who love him. Thugged out Chappie preparing for battle with the gang. 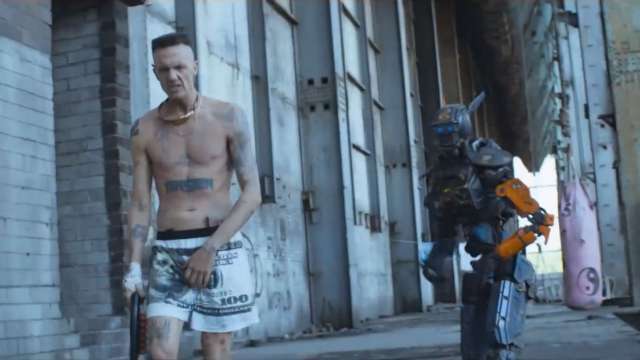 The use of Die Antwoord’s music to score much of the film (Hans Zimmer rounding out the rest) was an interesting choice. Their music is edgy, often catchy, even just plain weird (but in a neat way), and this style of music creates an aura of playful menace as we see a naïvely gleeful Chappie being manipulated into performing crimes and harming (even killing) people without his knowing. This film is appropriately rated R for its violence, and the intensity of that violence never seemed overdone, even if quite brutal at times. I should add that the action was great and the special effects were top notch. However, this film is as much an emotional drama as it is an action film. 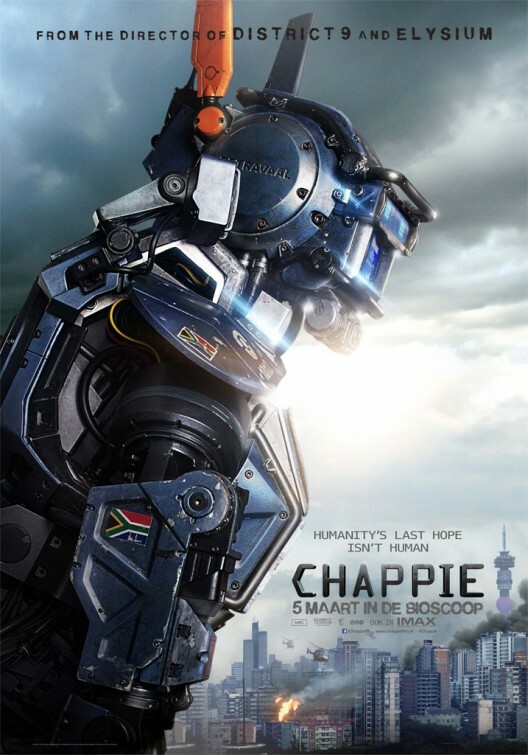 Above all, South African director Neil Blomkamp (District 9, Elysium) is tremendously successful at eliciting our emotional response to Chappie’s journey. When he is first imbued with consciousness, child-like and scared and unable to communicate, we feel tenderly for him. Chappie’s enthusiasm to learn about the world contagiously tugs at the muscles in our faces that make us smile. As he identifies a mother figure (Yolandi) we feel warm. When people try to take advantage of Chappie we want to right the wrong, and when a frightened and abandoned Chappie is beaten and damaged by street hoodlums, our hearts wrench and we come nearly to tears…it was difficult to watch. In the end the lives of our protagonists are threatened and, whereas most movies may allow us to comfortably “expect” a happy ending, the direness of the final act infected me with a sense of anticipated sadness. I won’t reveal if I left the theater feeling warm and happy, or sad. But I will say that this film took me on a powerful emotional journey and I have every reason to recommend it. Some flaws may keep this from being viewed as a great movie in the eyes of many, but it is absolutely a great story. 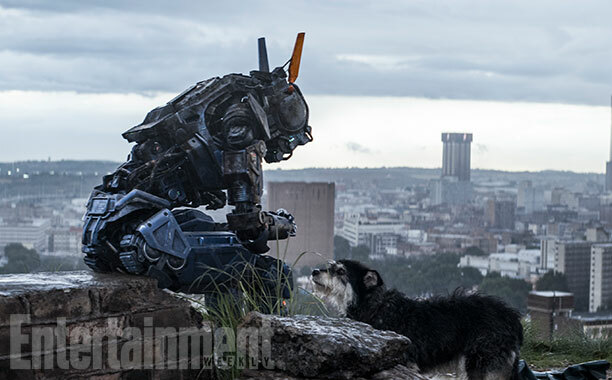 Chappie is vibrant, emotionally fragile and soulful; expect him to touch your heart. Great review. I gave this one a positive write up too. I agree that the film’s positives – particularly the social themes – outweigh the problems and I found it pretty charming too. Lots of polarized reviews on this film. However flawed this may have been, I was constantly engaged and never found myself negatively critical “during” my viewing experience. I think that says a lot about it. Thank you for your kind comment. Do Los Locos make an appearance? Well, sort of in the form of Die Antwoord. Thanks, Danaji. What did you like most about the film? Great review glad we both liked this film. Getting a bad rap at the minute and am not sure why. Flashbacks to the villainous corporate forces run amuck in Robocop (original) left me hoping for more. Saving grace was Chappies’ naming by Yolandi and her adoption of him as a surrogate son. Their interaction delivered this film from merely being a replay of Short Circuit and Robocop. The viewer could never be sure of how ‘tight’ Chappie was in with the gang of South African toughs until the lead begins to fly. Visually I enoyed most the decorations at Ninja’s hideout and the war paint applied to Chappie. The multi-colored guns had us rolling with glee. This film reached the same conclusion of most movies dealing with artificial intelligence…run for the hills to avoid extermination. Perhaps those working in the field should consider this before turning loose such forces.